Recently we’ve been writing quite a few ‘bulk’ APIs - where consumers don’t want a single resource, or a screenful of search results but instead need (close to) the entire record set. In this blog we discuss several features of the Mule ESB platform that make is easy to design and implement bulk APIs over a variety of back-end technologies. When your API deals with small messages (i.e. single resource or a screen’s worth of search results) it is trivial to pull into memory all the code and data you need to handle an API call. 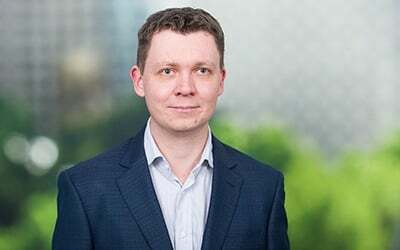 On the other end of the spectrum is up- or downloading the gigabyte- or terabyte-sized datasets common to web-scale analytics workloads - true ‘big data’ problems. In a ‘bulk’ API, data size is somewhere in the middle. Not so large as to require a dedicated mass data loading channel, but large enough the we need to design and code carefully to avoid pulling our full dataset into memory. Let’s call it a ‘big-ish data’ problem. The key concept to embrace is streaming at all stages in your code, so you can process your large dataset a portion at a time, retrieving input data on demand and sending output as soon as it is ready. This is especially true if there is data transformation involved since naive coding might result in you holding multiple copies of your entire dataset in memory while the transformation is in process. Restful Application Markup Language (RAML) is an industry standard for developing APIs in a contract-first style. Mule has excellent support for RAML through its APIKit module. Samples become stub responses in a skeleton API Mule implementation using APIKit code generation. Samples become metadata to define the input/output structures in your data transformations. Samples become instant test data to write unit tests using Mule TCK or MUnit. For an excellent in-depth tour of RAML, see this tutorial: Designing an Event Log API with RAML. A Bulk API is just an API. Nothing about the definition of your API contract changes just because your resource representations will be large. This is the beauty of contract-first development: it stops implementation details leaking into your interface. REST APIs tend to deal with internet-standard media types: XML, JSON etc. While it’s possible to write a Bulk API for many of these formats their tree structure makes it more difficult to stream data, particularly through a transformation step. CSV is self-describing - column names are included in a header row. CSV is flat - no need to keep track of what XML tags to close or how deep in your JSON structure you’ve gone. Each new record can simply be appended as a new line to the end of the previous output. CSV is simple - you do not need any specialised libraries to read or write CSV data. CSV is human-readable - easy to monitor and troubleshoot. CSV is by no means perfect. There is no support for datatypes (everything is a string) and the IETF standard is recent and not universally supported. If your data is a big long table though, CSV is worth consideration. As mentioned before, the tricky part of Bulk APIs is the implementation. You need the right patterns and the right technologies to retrieve, transform and publish data in a streaming fashion. It becomes even trickier when you need to compose those steps into a single flow and maintain the streaming property. Note: Mule APIKit places the API router and the logic of each operation in separate flows. I’ve combined these into a single flow because it makes it easier to visualise. The response half of the flow logic is no longer executed immediately. Instead it becomes the logic of an anonymous function / lambda / callback. Mule invokes the callback function once it has begun writing the HTTP response to the consumer (and so actually has an output stream to pass in to the callback as the input parameter). Mule obtains a java.io.OutputStream object representing the HTTP response channel and invokes the callback with this stream as a parameter. Callback function reads a small amount of data from the back-end response stream/iterator and buffers it. Callback function transforms the buffered back-end data into the required response format. Callback function writes the response bytes to the output stream. The buffered back-end data and any temporary objects created during transformation are no longer used and can be garbage-collected by the JVM to free up memory. Steps 2-5 are repeated until all fragments of the response have been written. When properly implemented, your callback is not only streaming but lazy. Just enough data is read from the back-end response stream just in time to output the next fragment of the response. * until there is a stream available to write it to. * attachements and message properties may be written to the stream here too. The Database connector was introduced in Mule 3.5, replacing the older JDBC transport. It supports a streaming mode built on the underlying java.sql.ResultSet cursor. Enabling this behaviour is as simple as checking the ‘streaming’ checkbox on the DB query processor. 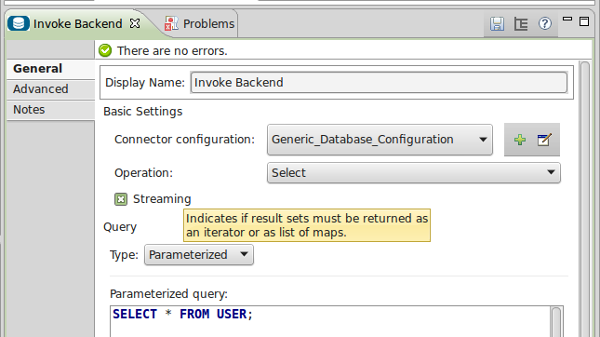 With streaming disabled, the DB query processor returns a List of Maps. 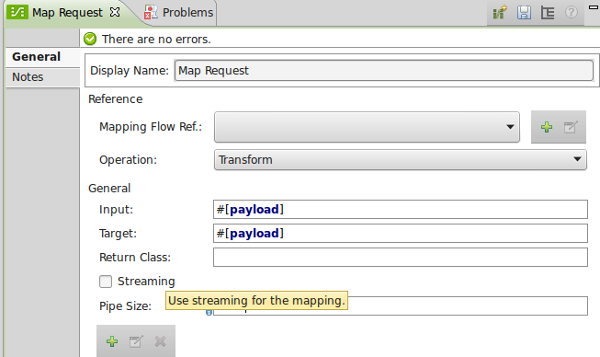 With streaming enabled, the output payload becomes an Iterator of Maps. when the next() method is called on the iterator, the DB module reads a single row from the underlying ResultSet and converts it into a Map[column name -> column value]. Streaming the response from an HTTP back-end service is beautifully simple - you don’t need to do anything. By default the output from a Mule <http:outbound-endpoint> is already a java.util.InputStream making it ideal to feed into a streaming transformation step. Many 3rd party APIs implement a ‘paging’ mechanism, where consumers must make multiple API calls with some kind of ‘page number’ or ‘record offset’ parameter in order to fully retrieve a large result set. The MuleSoft Anypoint Connector DevKit is a simple yet powerful SDK for generating custom Mule connectors from annotated Java classes. This framework provides special support for interacting with paging APIs. Your DevKit processor method returns a ‘paging delegate’ object that keeps track of the ‘next page’ and, when invoked, queries the back-end and returns each page as a java.util.List of objects. DevKit flattens this ‘lazy list’ of pages into a single continuous iterator object that can be fed into subsequent transformation steps. See the DevKit Query Pagination documentation for more details. AnyPoint DataMapper is a drag-and-drop data mapping and transformation tool provided with Mule Enterprise Edition deployments. It has its roots in the Open Source CloverETL library. DataMapper can transform to and from a range of common data formats and can operate in streaming mode (a reflection of its ETL heritage). DataMapper can stream transformations of structured data like XML and JSON. As with the DB connector, enabling streaming in DataMapper is as simple as checking a box. Additionally you can specify the streaming buffer size (in bytes). Tuning this value may improve performance if your individual records are very small or very large. In streaming mode, the output payload of the DataMapper step will be a OutputHandler instance. Write your carefully coded streaming transformation into an gigantic in-memory byte array. Helpfully set the ‘Content-Type’ outbound property. Write the gigantic in-memory byte array out the the consumer. Hopefully this article has given you the resources to design and build your own Bulk APIs on the Mule ESB platform. Writing lazy streaming code is never easy, but if you understand the concepts behind what you’re trying to achieve Mule’s features can make your life a lot easier.